In 1973, when I was a student at Tama Art University, my course of study was oil painting at the department of painting, but became interested in printmaking and then began a major in copperplate printing in my third year, and shortly after that began full-scale production of produced materials. Perhaps my mental native nature made me feel comfortable and fascinated with the rigid matière of copperplate prints rather than that of oil painting with its soft matière aspect. Our teacher was Professor Tetsuro Komai and he recommended students who were producing works by etching technique to produce their works in the most historical engraving technique among the intaglio printing techniques. My encounter with this form of engraving will later on decide the path I would take in life. In the etching technique, after drawing on a copper plate with a needle, the corrosion process by the acid in the lines and then producing the printed materials was not the kind of expression I was thinking about and I often became disappointed in the produced works. When I did engraving, I was able to express the line directly by burin on the copper plate; thus, my desire for an attractive expression in my thoughts and works became more than I thought possible. In order to engrave a clear line on a hard copper plate it is necessary to master accurate burin sharpening. I managed to somehow master this sharping technique, and so I devoted myself to engraving the lines verses using the etching process. After six long months, I continued engraving the lines into the copper plates and gradually it became possible to express the form I desired in my works, even while completing several studies. After graduating from post-graduate school in 1976, I began to embrace the dream of becoming a printmaker, and I was looking for a country to study abroad in Europe where the engraving technique was originated and developed in history. At that time, I heard from a friend, at the gallery in Yurakucho, that Galleria Grafica was holding an exhibition of British printmaking and workshops and I decided to visit the gallery. Reiko Kurita, the owner of the gallery, introduced me to Birgit Skiold who had been in Japan for the exhibition. When I told her that I was looking for a country and place to study abroad; she, to my great fortune, accepted me into the London studio presided over by her. While I was busy at preparing for my trip to England, on ​​November 20, 1976, Professor Tetsuro Komai who was under medical treatment at the time, passed away. It was a short association of less than 5 years, where I was fortunate to have him as my teacher, and I was influenced by his works. I also learned his way of living as an artist, and was happy to have shared this time of my youth; it was one of the happiest times in my life. On November 27, 1976, I departed from Haneda Airport arrived at Heathrow Airport and stayed at a hotel in Notting Hill Gate. Two days later I looked for an address that I had gotten from Birgit in Tokyo and visited the workshop. There is a book store on Charlotte Street #28 near the underground Tottenham Court Road station, and in its basement was the workshop. This Print Workshop was the first British artist workshop presided over by Birgit Skiold. I worked at this workshop three days a week and produced copperplate prints while I met a lot of artists and had a meaningful time for two years and nine months. Birgit introduced me to Morley College to obtain a student stay permission, wrote a letter of introduction to the Print Room of the British Museum, and gave me a lot of warm support. The brilliant experience of making works in the United Kingdom as an artist had a great impact on my life afterwards. It was a valuable experience that I was given and work hard for that also allowed me to conduct research on the “Old Master's” original prints at the Print Room of the British Museum and the Victoria & Albert Museum, which is still a source of printmaking today. From 1977 I began producing small size engravings and published the "Nature Morte" portfolio containing six works the following year. Frank Connelly, a printmaker who worked together with me at the Print Workshop, gave me the title of this portfolio. On March 1977, I rented a room for the first time at Brixton in the City of South London, and shared the flat with Italian students. I found a snail at the backyard of the flat and sketched it. The simple curved lines were engraved on the copper plate to complete the engraving, and the work titled "Snail" is still a memorable work that formed the basis of the subsequent production. A guy named Richard Michell, who was an assistant of Birgit, taught me conversational English and practical British living customs and we became close friends. One early summer day, Richard invited friends to the flat in Wandsworth Common where he lived, and I went to the party with Birgit and the artists of the workshop. While wandering about in the area near the party, the room of Julian, an art college student that lived in the room next to Richard, I saw that his door was open, and I noticed a strange object hanging on the wall when I looked inside the room. As I took a closer look, I noticed it was a dead bird of horrifying appearance, and perfectly dry like a mummy, it was scary and beautiful at the same time. Julian told me that his friend found this blackbird in a fireplace in a rural house in the country. When I showed the dead bird to Birgit, she said "Try to draw this bird Takuji,” so I borrowed it from Julian and brought it to Brixton. I was not confident as to whether I could draw this bird with its complicated form in actual size, but as I was watching for a while, I was able to grasp fine details and continued sketching several times. Heading toward the copper plate, I began to engrave delicate lines and completed the work in about 40 days. The work received very high praise from Birgit and friends who viewed it and it gave me wonderful recognition as an artist engraver in the UK. In September 1979, I thought about returning this bird to the person who had discovered it before leaving London. I went to see Julian’s friend, John, and took a print I had made with me. When presenting the print to John, he seemed happy and he said that “I’ll give this bird to you if you want;” so, I was pleased and later this bird came across the ocean with me in my baggage. I loved this blackbird so much, I got a different poses and produced two more engravings, and won the fame with my work entitled "Deadbird's Kubo-san" within the printmaking world. This blackbird became one of my famed engraving works and brought income to me, and it still “sleeps” at my atelier (workshop) in Yokohama, quietly, even unto this day. 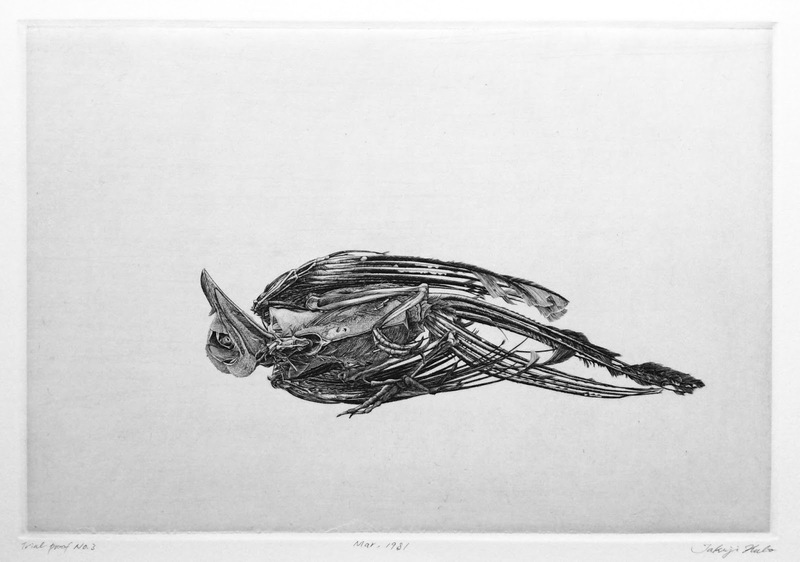 I occasionally open the box, and even now, this blackbird expresses the past reality that it was alive with its dead body, and I feel a deep beauty which cannot be compared with sorrow. I am thankful for a casual encounter across countries, and the “warm” friendships developed over this bird. The Intaglio technique which has the oldest history for engravings, occurred around Italy and Northern Germany in the mid-15th century. Engraving a copper plate directly with a V-shaped steel sculpture sword called burin, and filling the engraved lines with ink. Wipe the flat surface with cloth, press it with a press machine and print on dampened paper. In the 16th century it began to be produced all over Europe, and Albrecht Dürer's work is the highest peak of perfection. My teacher Tetsuro Komai studied abroad in France in 1954 and entered the National Art School with the recommendation of Kiyoshi Hasegawa, a Japanese pioneer printmaker who lived in Paris, and he began producing engraving under Professor Robert Kami in the burin major. After returning to Japan, he was instructed to recommend young students with engraving, I was lucky to have been one of them. In the early 16th century etching techniques started in Germany, in French it is called “Oh fault.” You coat the copper plate with a liquid ground mixed with rosin, beeswax, and asphalt and dry it. When drawing with a needle, copper is exposed only in that part. You then immerse the plate in an etchant and corrode the lines that have been drawn. Since it can be produced in a shorter time than engraving, it spread in many countries, and even today it is the most principal technique of copperplate printmaking. The work of Rembrandt van Rijn which was made in the 17th century Holland is the highest perfection in this art. Verify how the lines engraved by burin and corroded lines are printed and see the condition of the painting. The terms “Trial proof” in English means to reprint several times until one plate is completed. This Printing upon completion cannot be seen again, so it is very precious part of the overall works produced during copperplate printing. Kuroutadori. A Sparrow Eye bird of the thrush family. Males are black in color and the beak and the outer edge of the eyes are yellow. The total length is about 28 cm. They often appear in the gardens of houses in search of food and they are well known for their beautiful cries. I like a quiet song of the same title (Blackbird) and I listened to it in the 60's often. John's melody is fleeting, and Paul's lyrics have a faint hope in sorrow.